The rain was a welcome excuse to chuck my plans for my first day in Glasgow (garden and museum touring) and enjoy a lazy lounge-about day enveloped in the comfort of Hotel du Vin & Bistro. The row of five Victorian houses, which was built in 1886 as homes for wealthy merchant shipping families, was transformed into the original boutique hotel in the United Kingdom a century later by connecting buildings through corridors on different levels. However, the feel of a private residence remains, and so do the stained-glass windows in house No. 4 that were commissioned by Sir William Burrell, the same shipping magnate whose art collection I was forgoing by staying in. As I explored, I once or twice had an oddly thrilling moment when, having turned a corner, I thought I'd happened "backstage" because of the lack of flashy décor with which a different sort of luxury hotel would feel the need to cover every public nook and cranny. "It reminds me of my old school," a properly educated Englishwoman remarked to her husband in the sitting room. It was the William Morris wallpaper. 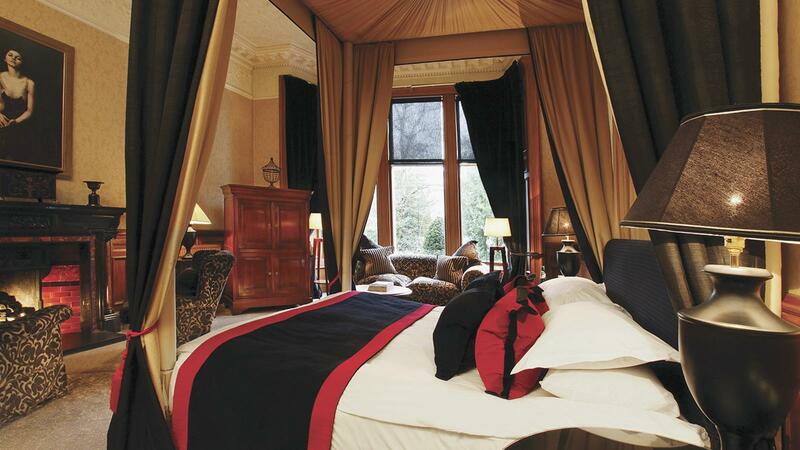 As part of the Hotel du Vin chain, the 49 rooms (from £170) are named for wines or wineries, except for the Jack Vettriano suite, named for the prominent Scottish artist who's a fan of the place. Four-poster beds and deep soaking bathtubs are standard issue. In a cheeky romantic gesture, the rolltop bathtubs in buildings No. 4 and No. 5 are placed in bay windows in the bedroom/living area, the better to enjoy the view over the park. Some rooms are duplexes, including the Domaine Georges Vernay conservatory suite (£395) with a terraced patio, good for enjoying a smoke. The massive selection in the whisky room is the pride of bar manager Ibon Mendiguren who is determined to present the spirit as a truly global one and hosts tasting events including one focusing on Japanese whiskey. Meanwhile in the recently renovated bistro, executive chef Barry Duff happily provisions the table with the best of Scottish bounty: Dunkeld salmon, Newtonmore venison, Cairnhill Chateaubriand and halibut from the Isle of Gigha. Finally I came upon the cigar "bothy," the bistro's roofed cigar shack. A welcome spot on the small terrace it faces southerly—perfect for enjoying the summer light with a daytime smoke. Mendiguren has a well-focused selection that includes Hoyo de Monterrey Double Coronas and Partagás Serie P No. 2 Tubos. Patrons are welcomed by the leather chairs, the vintage lightbulbs that illuminate them and the gas fire that keeps the area warm. Sometimes it's an adventure just to stay put.